ThriveCart allows you to enable email notifications for the sales through your account. It’s a notification that is sent immediately to you when a transaction is completed. These emails give you the details of the sale. You can enable this notification from within your profile (click the account menu top right of your dashboard then select My profile). Towards the bottom of your profile is the option to enable the email notifications. Or, in the case of owning the client license, they are sent to the email address in the profile of the owner of the product. There may be times when you want your sales notification to go to multiple email addresses. For example, you might have a business partner, staff member, or Virtual Assistant that also needs details of sales as they come through so they can process tasks. The good news is that it’s really easy to do this, and you don’t need to set anything up in ThriveCart. The most simplistic way is to have an automatic email forwarding set up in your email account to forward emails from receipts@thrivecart.com with the subject “Sale notification” to the different email address(es) you want to them to go. How this is done can vary slightly platform to platform, so it’s best to speak directly with your email provider for the exact steps. But another great way is to use Zapier! 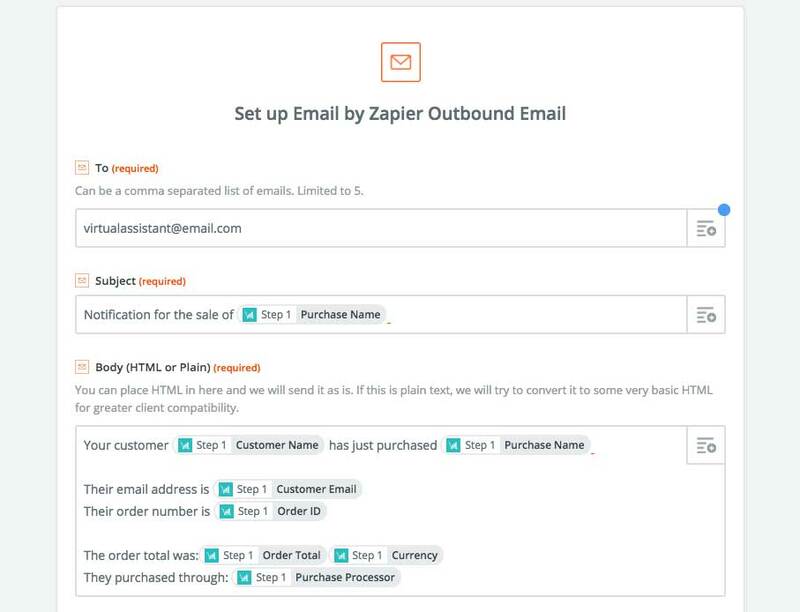 It’s very simple to get started with Zapier, and then use the specific triggers from ThriveCart to send emails to different people based on specific events. This means you’re are not limited to just sending an email when a sale is made. The best thing about using Zapier is that you can really be specific with what information is sent, and how this information is sent. You have complete control over the data included in the email and the formatting using Zapiers easy to use editor. There are so many possibilities for this. If you have any questions about sales notifications then please get in touch with the friendly support team directly.